Friday, Saturday, & Sunday, Sept. 2-4—WOODSTOCK—Home of the longest continuously running 100-mile trail ride in the country, the Green Mountain Horse Association (GMHA) will celebrate its trail heritage with its annual Distance Days on Friday, Saturday, and Sunday, Sept. 2-4. Trail rides will range from the six-mile pleasure ride to the flagship 80th anniversary 100-mile ride along with banquets, barbecues and other unmounted fun for all to enjoy. The 100-mile ride is the centerpiece of the weekend’s activities. The ride will traverse 40 miles on the first day, 35 on the second,and the final 25 on day three, covering terrain in the towns of Woodstock, Reading, Hartland, West Windsor and Hartford, and visiting such historic and classic Vermont landmarks as the Marsh-Billings-Rockefeller National Historical Park and the Taftsville covered bridge. Spectators are welcome and encouraged to cheer riders on at several scenic lookout points along the route. For horses (and riders) not quite up to the challenge of the three-day, 100-mile ride, GMHA is offering the inaugural 100-mile team relay. There are several ways to participate. Teams of two to three riders can get together, with each rider responsible for riding only one or two days of the 100-mile trail. Alternatively, one rider could ride two or three different horses at each of the shorter distances. Each team member’s final score for his or her leg or legs of the ride will be averaged to come up with the relay total. Competitive riders may also choose to compete over several shorter rides that will be held over the course of the weekend. Options are available at 60-, 40-, 35-, 25- and 15-mile distances. All riders are invited to participate in the extremely popular pleasure rides that are held concurrently with the competitive distance rides. Pleasure rides will be offered at short (six to eight miles), medium (12-15 miles) and long (20 miles) distances on Friday and Saturday, with six- or 10-mile ride options available on Sunday. Pleasure riders looking for an extra thrill can sign up for the 50-mile Pleasure Horse Challenge. These riders will cover 20 miles on Friday and Saturday, and 10 miles on Sunday, all at their own pace. Horse-and-rider teams that complete the 50 miles will receive a special prize during Sunday’s awards ceremony. Special events over the weekend include the 100-mile banquet, to be held at the Woodstock Country Club and chaired by longtime Woodstock resident Mrs. Nancy Lewis, who rode in the 1946 100-mile ride. A special presentation by historian and author Dale Johnson at the banquet will spotlight the role of the historic Woodstock Inn stables in the early years of the ride. Riders will also have a chance to thank landowners for their support at the catered barbecue on Friday, allowing a fun and informal opportunity to share memories and fun. Between the finish and awards ceremony on Sunday, 100-mile alumni will gather for a Longtimer’s Reunion. Finally, Sunday’s awards ceremony will follow the traditional catered brunch. Founded in 1926, the Green Mountain Horseman’s Association is the oldest continuously operating horse organization in the country. As a 501(c)(3) non-profit organization, GMHA is dedicated to holding equestrian events, educating equestrians of all ages, and preserving trails and open space. For more information, visit gmhainc.org or contact Trails Manager Chelle Grald at michelle@gmhainc.org or 802-457-1509. 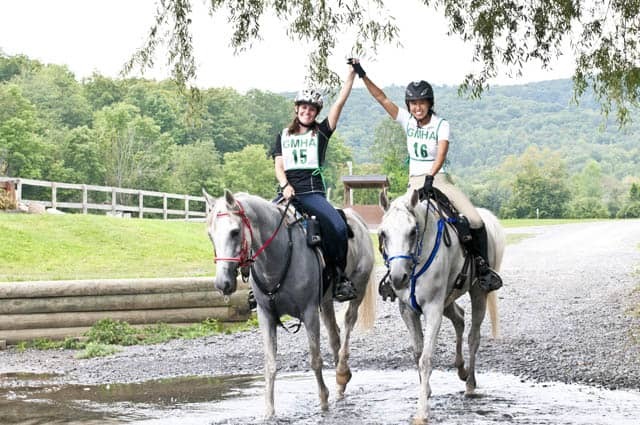 Riders Krista Alderdice and Carrie Tenney enjoy a victory high-five together at the finish of the 100-mile ride through Woodstock, Reading, Hartland, West Windsor and Hartford.